It’s not unusual to see a work of art that highlights the shape and form of a human body at the expense of the subject’s face. We’re accustomed to seeing statues of headless torsos; paintings of figures in which the gesture and movement of the body is so important that we don’t even see the face at all; photos in which we notice the body, clothed or unclothed, and the face is turned away or covered. But when we see a portrait, we expect to see the face. Sometimes smiling, sometimes serious, sometimes staring at the viewer in defiance, sometimes looking over the viewer’s shoulder into some unknown distance, but always clearly visible. So when we encounter a portrait and the face is obscured, it feels surprising and shocking, it imbues the work with mystery and meaning. 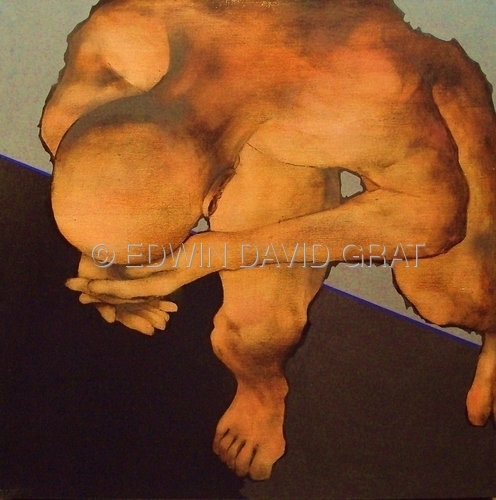 In Ewin David Grat’s paintings the face is rarely visible. Instead we get a view from the top, we see bald sculls, we see arms and hands and shoulders, but we almost never see the face. This lends the paintings a mysterious universality. The figures could be anybody or everybody, and though we see them in specific poses, poses that feel they belong to a distinct person, we have no features with which to identify them. We wonder what they think and what they feel as we try to catch a glimpse of their eyes. Francis Simeni’s richly-toned portraits are beautifully real and alive. He paints with acrylic and oil on wood, and the shape of the subject’s face comes alive in warm tones. Frequently the person in the portrait is looking straight at the viewer, with impudence, with a question, with a shared joke. 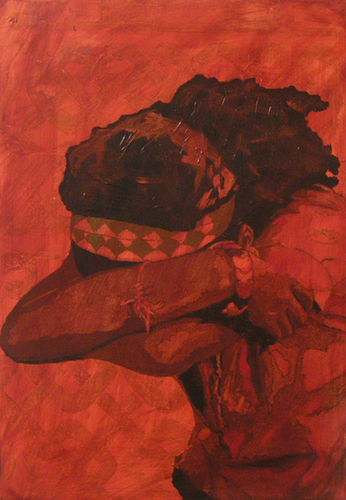 In one painting, entitled Vanishing Chains, we see a girl with her arms over her face, and her head bowed. Because we can’t see her eyes and her expression, we want to know more about her story, we want to connect her gesture with meaning. 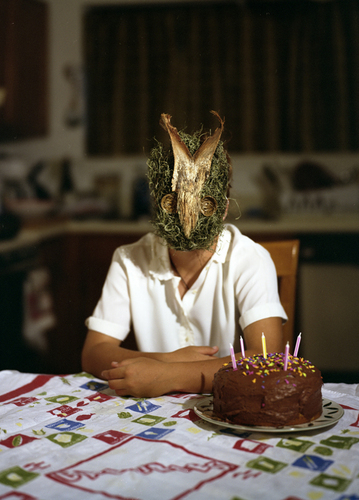 In the work of photographer Laura Bennet the masks themselves become art. Her series “Infectious Myth” examines four mythical archetypes symbolizing transitional stages in the female life cycle. The strange, beautifully crafted masks lift the subject from the specific to the mythical. 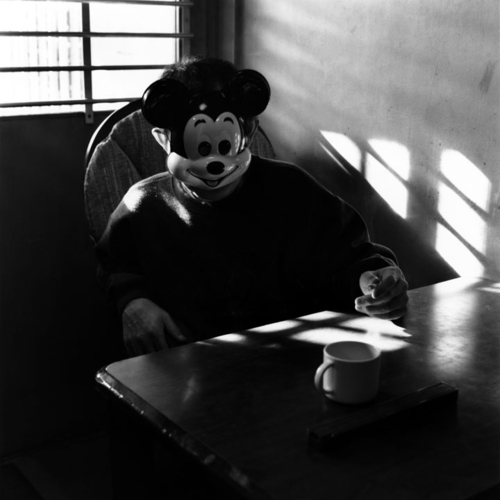 They retain something of the ordinary, of the human, but they become characters with deeper meaning and older stories. When we see a portrait with the face obscured we’re forced to look harder and think more deeply. We ask what is hidden and what truths are revealed by the act concealment. We cannot take the painting or photograph at face value: sometimes the less we see, the more we understand.